This CD uniquely sets out to capture the musical magic from 3 great film series: Stars Wars, Harry Potter and The Lord of the Rings, and it achieves this goal in superb fashion. Listening to the album is like a musical odyssey summarising the plots as the mood changes from one track to the other, and it does this picking at least one track from each film. You might think it would be difficult to choose from so many good tunes, but this CD seems to have the knack for choosing the best and most appropriate tracks from each film. The John Williams music from "Star Wars" is presented in release order starting from Episode IV "A New Hope". This quite rightly is represented by 3 tracks including the iconic Main Title theme, Princess Leia and that equally iconic but fun set-piece from the weird creatures of the Cantina Band. Episode V of course has Darth Vader's The Imperial March then introduces Yoda's Theme, and this is followed by Luke and Leia from Episode VI. Then going back in time to the prequel films in the story, first in Episode I we have the ideal combination of the dramatic Duel of the Fates and then the initially innocent Anakin's Theme which morphs into a hint of the Vader to come. Finally Episodes II and III are represented by the big love theme Across the Stars and the climactic Battle of the Heroes. Staying with John Williams for the moment, the Harry Potter music is satisfed with one track from each of the films he scored: Harry's Wonderous World from "Harry Potter and the Sorcerer's Stone", the titular The Chamber Of Secrets from "Harry Potter and the Chamber Of Secrets" and finally Aunt Marge's Waltz from "Harry Potter and the Prisoner of Azkaban". Then we have a complete change in composer as we move into traditional fantasy stories with the Lord of the Rings trilogy. Just as these movies have introduced new viewers and readers to the rich world of Tolkien's stories with its superbly detailed tapestry of characters, places and history, the music of Howard Shore echoed this richness with a diverse range of themes and moods representing key aspects of this multi-faceted world. May It Be & Themes is essentially a short compilation of familiar themes setting the scene in the first film "The Fellowship of the Ring". Then we have The Hornburg from "The Two Towers" and The Ride of the Rohirrin from "The Return of the King" rounding off the musical visit to this wonderful trilogy. There is a problem that sometimes happens with re-recordings of film music and that is that somehow it just sounds different from how you remember it, and that conflict with your memory can be a distraction from full enjoyment. On Great Film Fantasies that problem just doesn't occur. 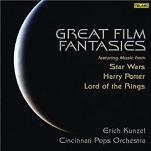 Erich Kunzel's enormous experience conducting the Cincinnati Pops Orchestra in a large number of film music recordings and his friendship with John Williams and other film composers is such that he pays attention to all these key features with his choices of tempo, balance and phrasing. But this compilation does not set out to be a recreation. Instead the performance easily brings out many nuances which were always present but perhaps lost among the on-screen action. In this sense this latest compilation is better than the original tracks and the recording just sparkles with the added definition now achievable through better recording and mastering techniques. Great Film Fantasies is available from Amazon.com and Amazon.co.uk.